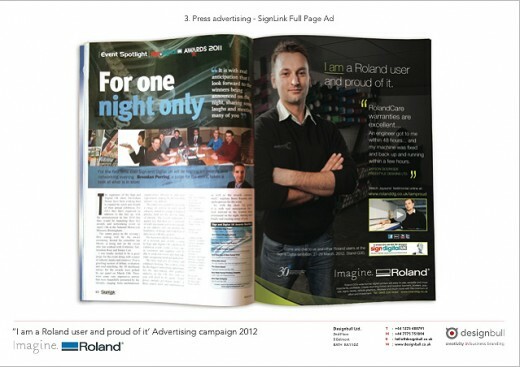 We were approached by Roland DG to pitch for their 2012 advertising campaign in February 2012. Roland DG provides high-performance products for professionals in the sign, commercial print, packaging, label, garment decoration, promotional gift, textile, engraving, dental and 3D modelling industries. From our initial meeting at their head office, and reading their concise marketing brief, we followed the testimonial route. They suggested that due to the short timeframe, there would be no time for photography of their real customers with testimonials, and to just try a ‘typographical’ style. I said that it was important to get at least one image of a customer for the launch of the campaign and I was willing to go and get it! After the meeting I spoke to a signwriter friend Jayson Godridge of Freestyle Designs, who I found also uses a Roland printing machine in his setup and he praised it’s qualities to me! He was happy to let us take some shots of him in his busy workplace and get a video testimonial. I then got in touch with Andy McCreeth, a photographer/filmmaker for sonicstate.com and asked if he was available to help. With no promise of a fee, he agreed to get involved with the photography for the pitch over the following few days. He suggested we also include a video testimonial in addition to the photoshoot. His Nikon camera can film both images and video. We completed the photoshoot for the press and online advertising imagery and videoed the testimonial in one day! Then, I presented them with the testimonial video as a follow up to the press ads. They we’re amazed at how we turned around the finished ads within a few days, and made us the preferred supplier on the spot! Once the campaign has finished, I’ll be updating the portfolio with a full case study of the full campaign. 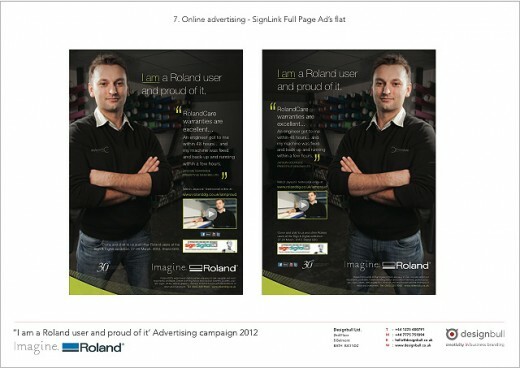 This entry was posted in Business and tagged Advertising, animated gif, pitch, Roland.